BuxP is a well-established GPT site which was launched in 2008 and since then it has paid more than $541228 to its members. And currently, has over 655954 registered users. To find more about BuxP and to write an in-depth review I went to the one who knows everything- Google. I was a bit surprised to see that most of the BuxP reviews were treating BuxP as a PTC (Paid TO Click) site, which it isn’t. A PTC site is one which only pays for viewing ads. And with BuxP you can make money with a number of ways. Therefore, BuxP is a GPT site. Note: BuxP is closing down. Why don't you explore InfoSmush for other legit GPT sites ☺. BuxP is a company which allows one to buy traffic, FB Page Likes, YouTube views, Twitter Followers, etc. And people can make money by doing these tasks. Is BuxP Legit or Scam? BuxP has been around for 9 years and that’s enough to prove that it’s legitimate. The typical Paid-To-Click system: you will earn for viewing ads. These ads pay from $0.001-0.007 and you need to view the ad for 10-30 seconds. As you know viewing ads takes very much time for very less, but if you decide to try it, don’t click on the last ad on the View ads Page. The ad at the bottom of the page is to ensure that no one is using a bot. clicking on it will reset your balance to zero (ouch!). And if it is clicked for 3-5 times your account will get permanently banned. In other words, you can’t use bots. By completing tasks you can earn from $0.01 to $4. These tasks are not affiliated by CrowdFlower but posted by BuxP’s members/advertisers. The tasks on BuxP are similar to what you see on Microworkers. All “Members’ tasks” pay $0.1 while rewards vary in case of “BuxP tasks” ($0.01-$4). Some examples of tasks are: Sign up tasks, download tasks, etc. So, tasks are simple and quick to complete. Video offers require you to like a video and also write a comment of minimum 5 words in English, related to the topic of the vi. Before you can see video offers you will need to add your YouTube Profile Name in your account settings. When you click on the video this pop up will appear explaining the first step. Click on the button in the centre, this will open a new tab and the pop-up will show the second step with a text box on the left side. In the text box copy and paste your comment and submit. Each video offer you complete gives you $0.008. You need to watch the videos (or let the video play in the background) on YouTube or Vimeo for 50 seconds after that $0.001 will be credited to your account instantly. When you click on the video ads a window will pop-up and the video will automatically start playing. Don’t close the pop-up window as this will revoke your credits and might get your account banned. So, wait for the timer to end to get your reward. Now you can close the window. You can earn $0.015 per Facebook page you like. This takes less than 7 seconds, so always check if this offer is available. To earn by liking Facebook pages: Go to Earn Money and from the drop down menu hit “Likes”. On the next page (if FB Likes are available) you will see two buttons- Like and Confirm. Now click on the like button, a new window will open, just like the page and click on “Confirm”. Your account will be credited with $0.015 instantly. You will find various offer providers including Wannads, SuperRewards, and AdscendMedia. Most of the offers are sign up, download and install and mobile offers. But some offer walls also provide surveys e.g. Wannads. BuxP gives its members special rewards for just being active. You don’t need to do anything extra to get the ClickRewards. It’s free. However, users completing more offers, tasks, etc. have better chances of winning. In BuxP Lottery members are awarded up to 10 referrals. But it’s not free; you need to buy tickets to get a chance to win referrals. Each ticket costs you $0.25 and you can buy as many tickets as you like. Another gamble section under “Casino”, but here you will win cash instead of referrals. On the jackpot page, there are 100 cells, red cells are sold cells, green cells are bought by you and white cells are those which are available to buy. Once all cells are bought winners are decided randomly. BuxP’s referral program is the best among all the sites that I have reviewed. Well, all the sites (that I have reviewed) offer between 30%-10% (mostly 10%) referral commission which is pretty low. Some sites also have 3-level and 2 level referral programs but still you won’t earn as much as you would on BuxP. Because, BuxP lets you earn a whopping 50% of your referrals earnings. That is half of what your referrals earn. But you can earn more from your referrals by upgrading your account to premium. And that ‘more’ is 100%, you will get 100% of what your referrals make. Crazy, right? Priority Payments / Get paid INSTANTLY. DOUBLE referral earnings: 100% instead of 50% click earnings from your referrals! DOUBLE video, video offers and survey earnings. Earn 7.5% commissions from sales made through your referral link! Higher chance to win ClickRewards. Ability to message your referrals. Ability to replace your referrals. Golden status on the forum & shoutbox. More stats regarding your referrals & offers. 200 free credits to promote your website/referral link in our traffic exchange system. You can not only earn by referring people who want to make money online but also by referring buyers (people who want to buy likes, views, traffic, etc). As a standard member, you get 2.5% commission of each sale you make and premium members get 7.5%. Top Commission: BuxP rewards its top 10 affiliate marketers every month with the prizes like BuxP points, referrals, premium days, lottery tickets and more. The minimum amount you need to request a withdrawal is $6.99. It’s higher than other sites but since earnings from referrals are so much you will soon be able to withdraw. You can redeem your earnings through PayPal or Payza. Your name on BuxP account and PayPal/Payza account must be same to get your cash. 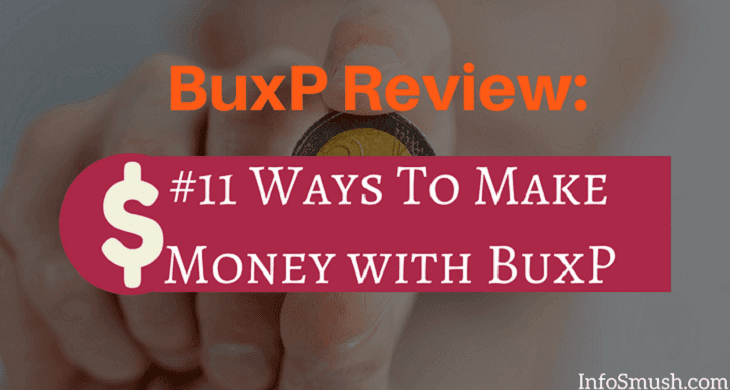 In this review, we talked about the methods to make money with BuxP, and it is true it won’t make you rich (actually, no site can, unless you have a huge list of referrals). But it will help you earn a few bucks every month by using it with other reward sites. And when you have enough active referrals your earnings will increase drastically. You should definitely join BuxP and use it along with other sites to increase your overall income. Which way to make money with BuxP did you like?